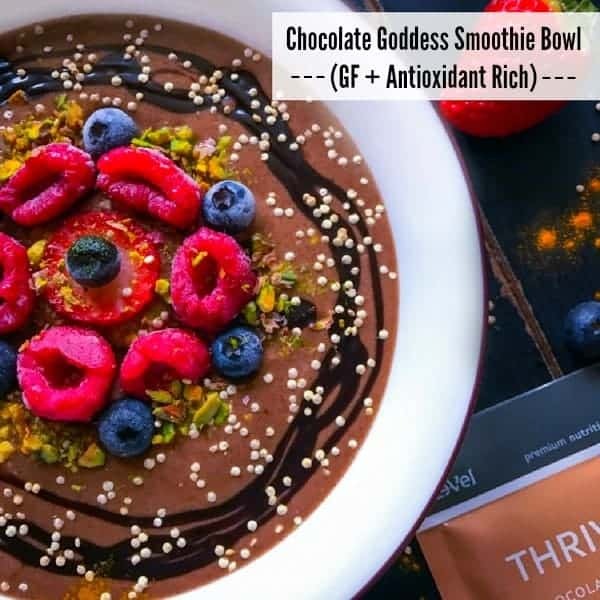 Chocolate Goddess Smoothie Bowl (GF + Antioxidant Rich) is a gorgeous looking creamy-chocolatey bowl that’s filled with antioxidants and tastes absolutely divine. It’s perfect for breakfast or any meal of the day. Okay, can we just take a moment and give thanks as all our dreams of having chocolate for breakfast are coming true! I just cannot stop raving about this Chocolate Goddess Smoothie Bowl that we tried a couple of weeks back and I’m seriously making them almost every other day for breakfast or a quick snack. 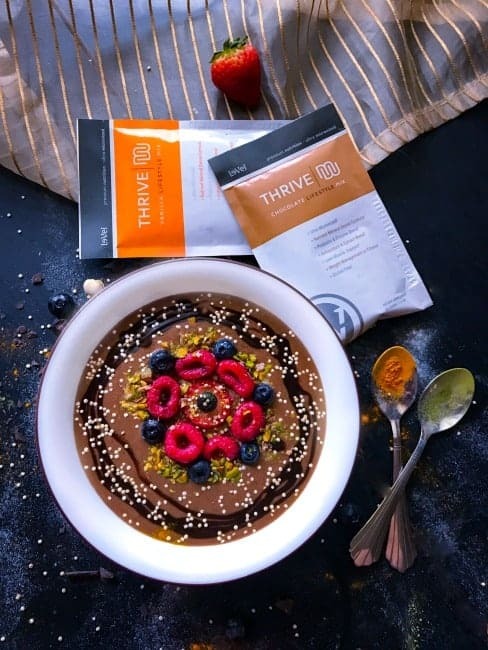 It makes for such a healthy breakfast that’s packed with the goodness of THRIVE Mix (I’m going to share more details below), turmeric, matcha powder, berries, banana and of course chocolate. It’s like a dream come true and an absolute change from the fruit smoothies that we are usually making. And with so many beneficial properties, we had to try it and make it a part of our lifestyle as we totally agree with Le-Vel when they say – “Live More, Be More, Experience More & Thrive for More”. So after adding that powerful mix, I wanted to make this smoothie bowl even more extra special. So I went ahead and added berries, banana (it just makes the smoothie even more creamy), dark chocolate bits, some flax + chia mix. And before I would finish the entire ingredients taste testing, I quickly blended it with some almond milk but you can use any other choice of milk too. Now, when the smoothie is this delicious and looks this pretty, you definitely have to name it Chocolate Goddess Smoothie Bowl. We need some sort of ice so that the smoothie holds that chunkiness- frozen fruit works best (if you don’t want a watery taste). You can make it more or less chunky as per taste. We need a good blender that can minutely churn everything, so that we are not left with bits n pieces while having it. You need to serve the smoothie bowl ASAP or the ice will melt and you’ll end up with a smoothie – soup (which tastes equally good but kinda soupy). Also, as per a recent study, a little bit of dark chocolate is linked to good health and it’s also great for your memory. Hence, you can imagine what my go-to breakfast or snack is going to be for the next couple of days! 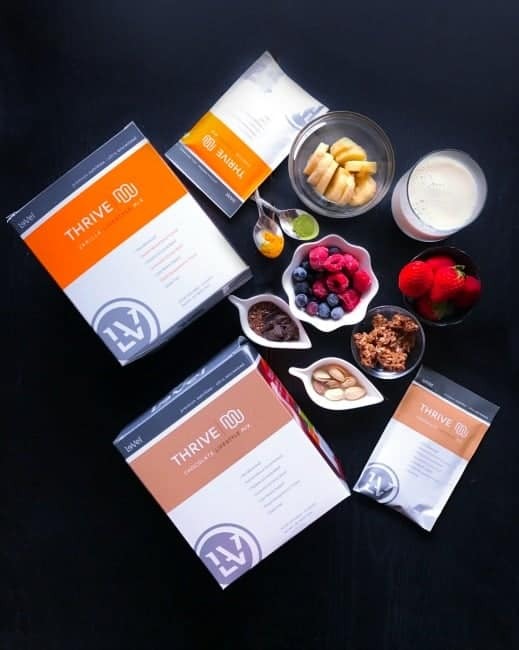 You might also see me making some chocolate shakes using THRIVE Mix because it is so yummy and good for me. THRIVE Mix is part of the Thrive Experience which includes Thrive capsules taken on an empty stomach followed 40 minutes later by Thrive Mix and then applying DFT (Derma Fusion Technology). 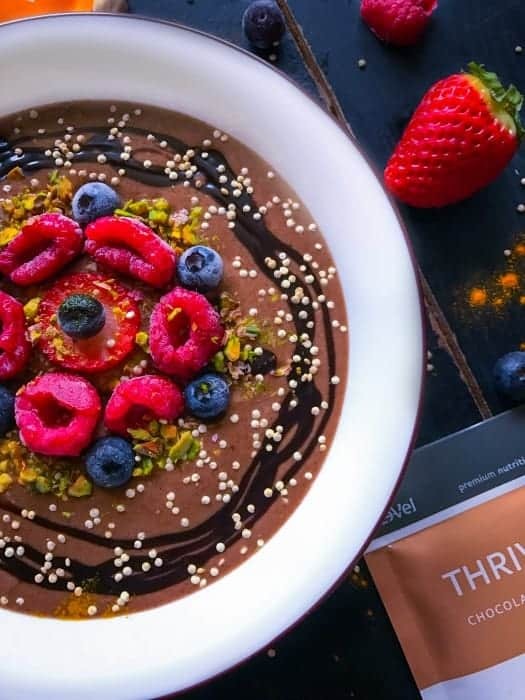 So if you are doing the Thrive Experience, you can mix in a smoothie bowl using THRIVE Mix sometimes. So, go ahead and try this smoothie and indulge your inner chocolate cravings. Also visit the website for Le-Vel to learn more about THRIVE Mix and the full Thrive Experience. DID YOU TRY MY RECIPE – AWESOME!!! #easycookingwithmolly + @easycookingwithmolly on Instagram –> As I Loooove to see you recreate my recipes. (GF + Antioxidant Rich) is a gorgeous looking creamy-chocolatey bowl that’s filled with antioxidants and tastes absolutely divine. Add all the mentioned ingredients in a blender and pulse to form a smooth consistency. 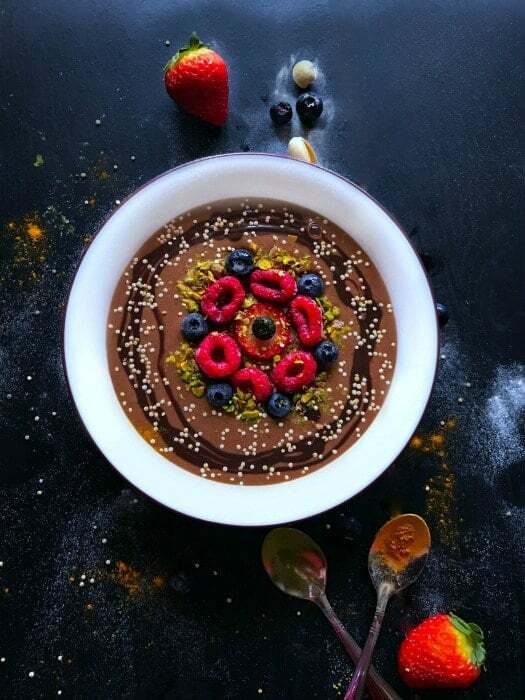 Transfer the smoothie to a bowl and decorate with raspberry, blueberry, pistachio and dark chocolate syrup. Sprinkle some roasted quinoa seeds. This post is sponsored by Le-Vel but all opinions are my own. 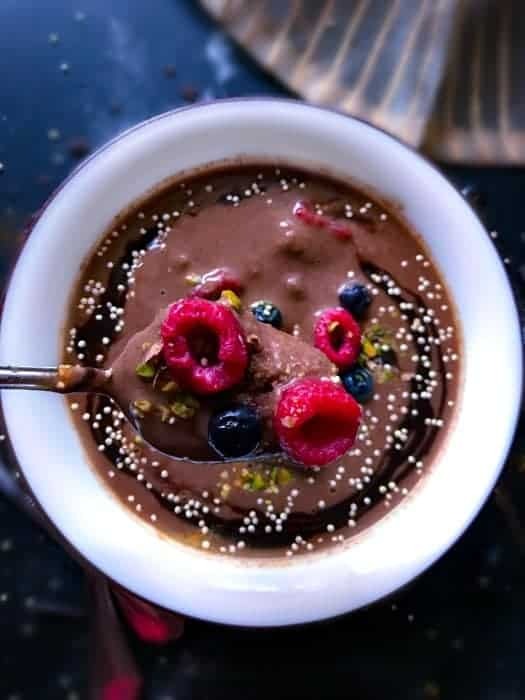 38 Replies to "Chocolate Goddess Smoothie Bowl (GF + Antioxidant Rich)"
I love this smoothie bowl.I am getting great flavors that are healthy and tasty. Throw in a little chocolate and I am over the moon! Delicious! Chocolate smoothies are the best.